I was knocking on my principal’s door every single day to get an answer as to whether I could bring Richard to prom. Finally the school’s lawyer said there was no school policy against it, but urged me not to. But I told them I was going to do it, and then I told everyone. In the beginning it was a matter of civil rights. Once February hit and Constance’s story hit the news, it really hit home for me that I needed to have a positive experience and share a positive experience. It didn’t turn out exactly like that. I got home that night and the lights were off. My mother told me to pack my stuff. I put everything I could into trash bags, got in the car and sped away. It was as dramatic as it sounds. I drove to my friend’s house. I’d actually lived with her before. When my parents found out I was dating Richard, they threatened to move me to relatives in South Carolina. I knew my parents wouldn’t hit me but I was scared they’d take away everything, so I moved in with my friend. Then my parents said I could try again, so I moved back with them for my senior year. When the press hit over the prom thing, I moved back in with my friend. During this period, one guy pulled up in his truck and said, “Next time I have a gun, I will shoot you.” I would take a different route every day when I was going home. They stationed a police officer outside the tutoring center where I worked. But even with everything I had to deal with, prom was everything I could hope for with the person I wanted to be with. My dad is a teacher at the school and was working prom. He watched us all night long and made sure we were safe. He didn’t like that I was gay, but he’s never stopped loving me. He just didn’t support the lifestyle. Even after everything, I feel like the situation was a win-win. When the story hit the news people started sending me donations. It showed the strong support of the gay community. After prom we sent out an autographed picture of us from prom night to people who donated as a symbol of our appreciation. When I flew out to California this summer to go to GLAAD’s media event, one of our donors said Richard and I could stay at his place in San Francisco with him and his husband. I marched in San Francisco Pride and had VIP seating for LA Pride. It sounded odd at first for someone to be willing to offer their home to us, but it ended up a great experience. They are like my family now, and I can never thank them enough for their guidance and support. It came at a time when I really needed it. Richard stayed with us for the first two months, but then he and I started to disagree. We both went our separate ways, and he flew home a month before I did. It was sad saying goodbye to someone I loved. But it was a chance for me to reevaluate my life, and to make sure I was staying true to myself and my goals for both my push toward equality and my small-town, innocent-boy background. I went back to Cochran a month ago. Going from California to Statesboro was just going across the country. Going from Statesboro to Cochran was like going back 100 years. I’m not saying they haven’t made strides forward, but it just feels like a giant step back for me. 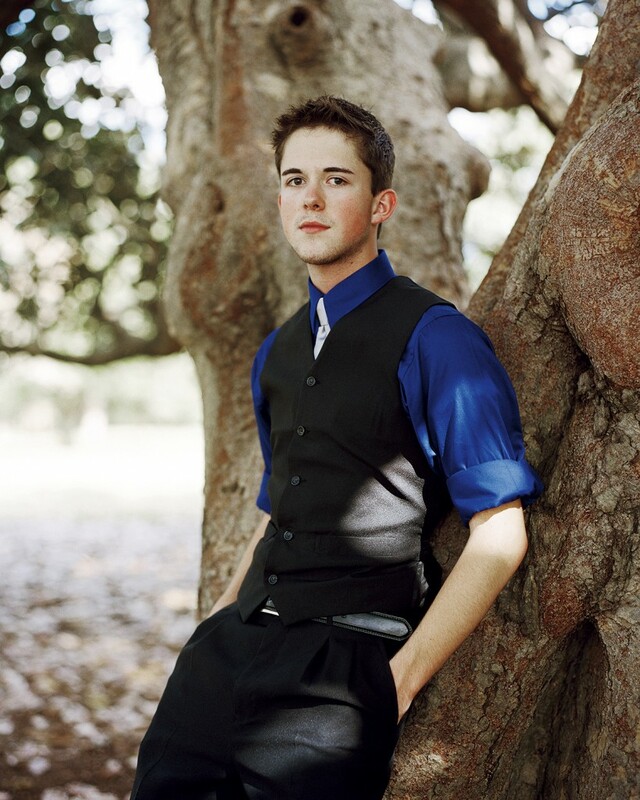 When I was in California, I founded Project LifeVest to help young LGBT kids in crisis. I saw this as an opportunity to help people in Georgia, but now we’re getting calls from people throughout the world. I’ve helped people in Peru and California. Young people have contacted me who are considering suicide and dealing with abuse and bullying. I’ve told all my professors about Project LifeVest, so if I get a call it doesn’t matter what’s going on; I’m allowed to leave class. After the large increase in known teen suicides, I really don’t fool around when it comes to my job. I love what I do, and I’m grateful to be able to save lives. Just yesterday I got a call while I was sitting in calculus class. A boy at a local school was being bullied. I left class and ran over there, but by the time I got there the situation had escalated and he landed in the hospital. I spoke to the school and all the individuals involved. Now we’re working to get a better bullying policy in place. The worst punishment the kid who beat him up could get under the current policy is a one-day suspension. I only sleep four or five hours a night, and I lose sleep over Project LifeVest. I only have four or five hours of sleep a night. But being in college, you have to have time to enjoy yourself. Georgia Southern is really accepting. They just had a gay prom. I didn’t go. It sounded fun, but prom just wasn’t something I wanted to do again this year.